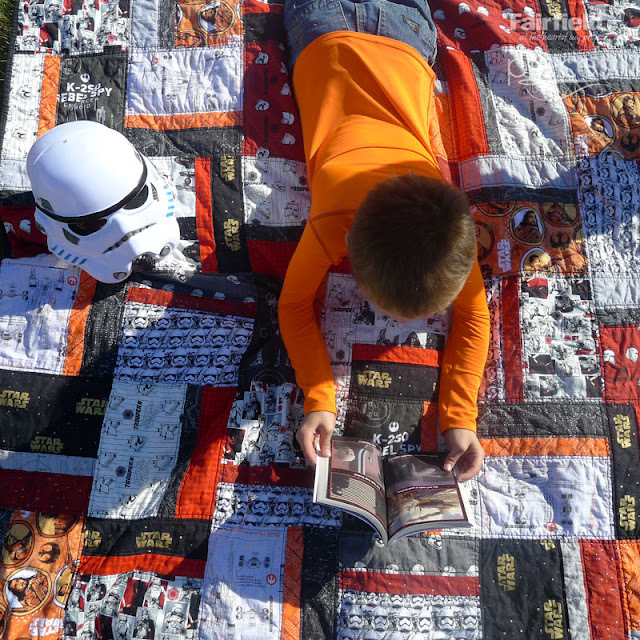 You're going to love this simple Star Wars Quilt-in-a-Day Pattern. 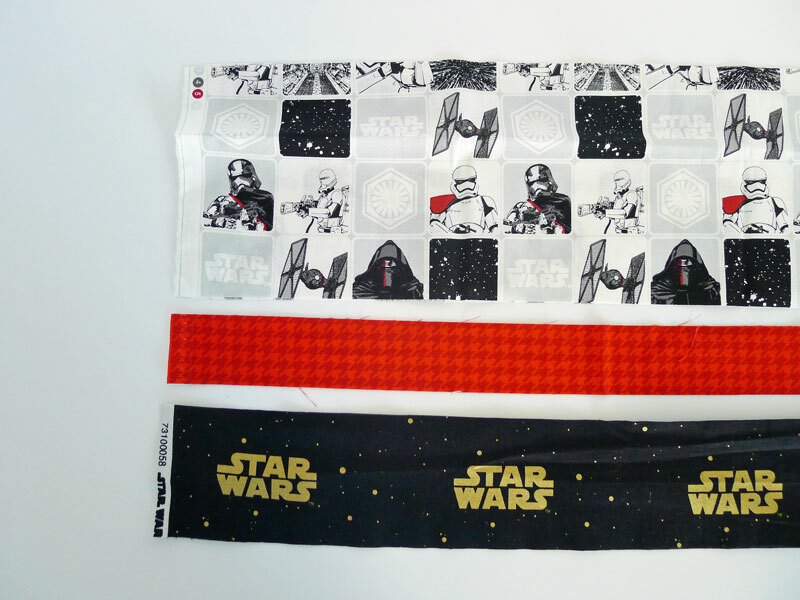 Don't feel limited to Star Wars though...this is a great pattern for any theme. 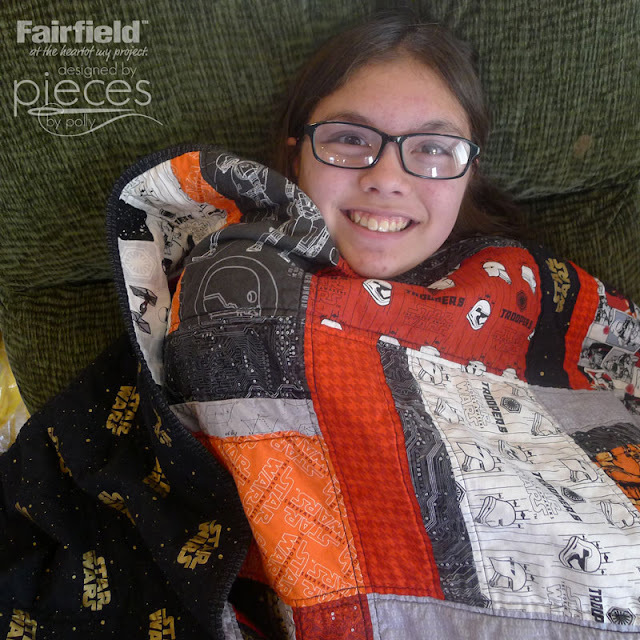 We'll use easy strip-piecing so that you could put this whole quilt together in a day, start to finish. 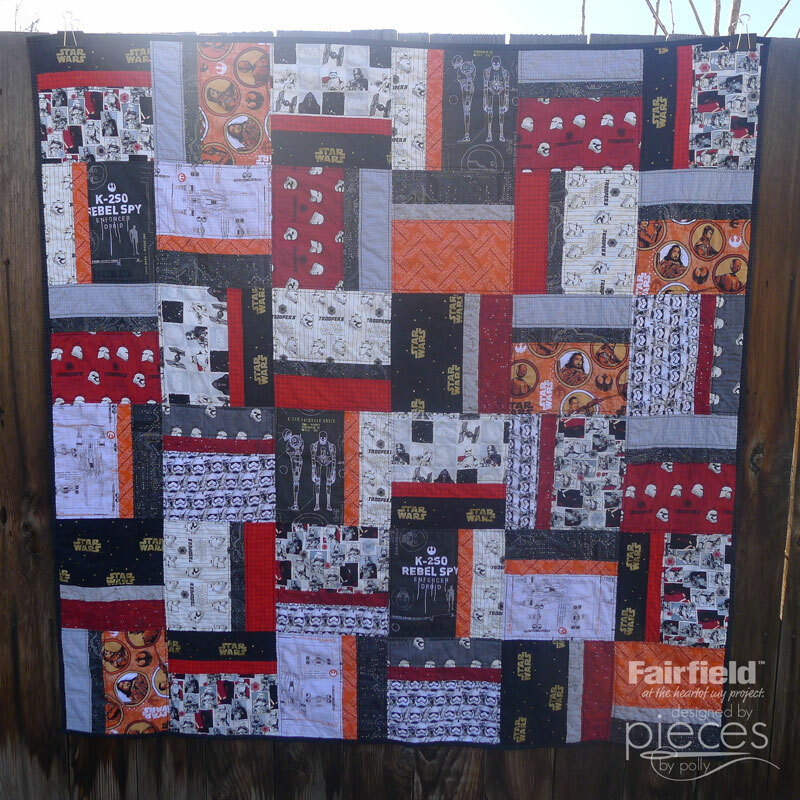 Thanks to Fairfield World for their continued support of my creativity and for their help bringing you this pattern. They provided me with batting and have compensated me for this post. All thoughts, opinions, patterns, ideas, and enthusiasm are 100% my own. My daughter is a Fan Girl to the core in several fandoms, but one of her newest loves is Star Wars. She's been asking for a Star Wars quilt for a while, so she was happy to get this one. 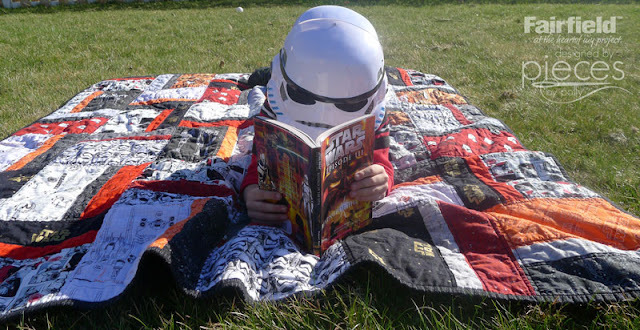 But it's also perfect for your favorite Storm Trooper to lounge on while reading a good book. 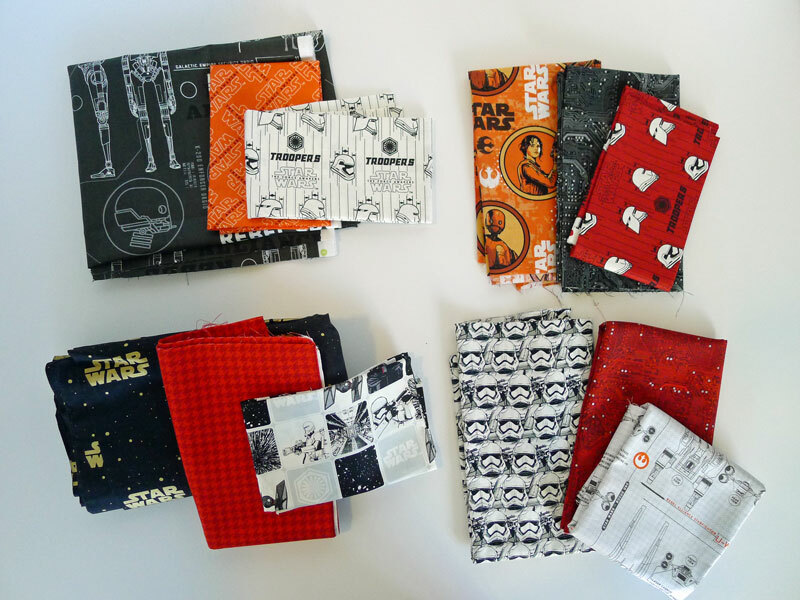 Variety of Star Wars and coordinating fabrics cotton quilting fabrics totaling 3 1/4 yards for a 60 x 60" quilt or totally 2 1/4 yards for a 40 x 60" quilt. I tend NOT to wash my fabrics ahead of time because I find them easier to work with fresh off the bolt. 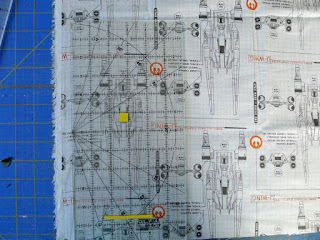 This will result in your finished quilt shrinking a bit from the state sizes. 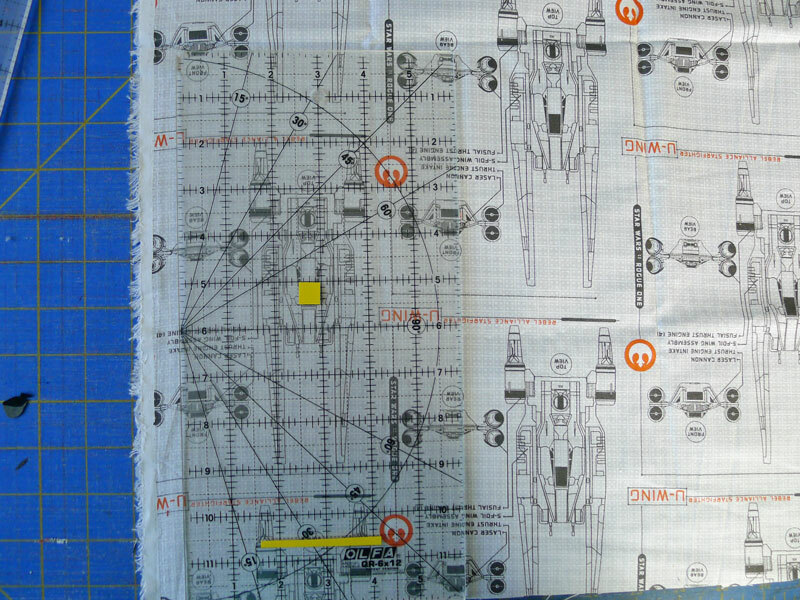 We'll need a full 42" width to get all 4 needed blocks from our fabric and prewashing may cause too much shrinkage. 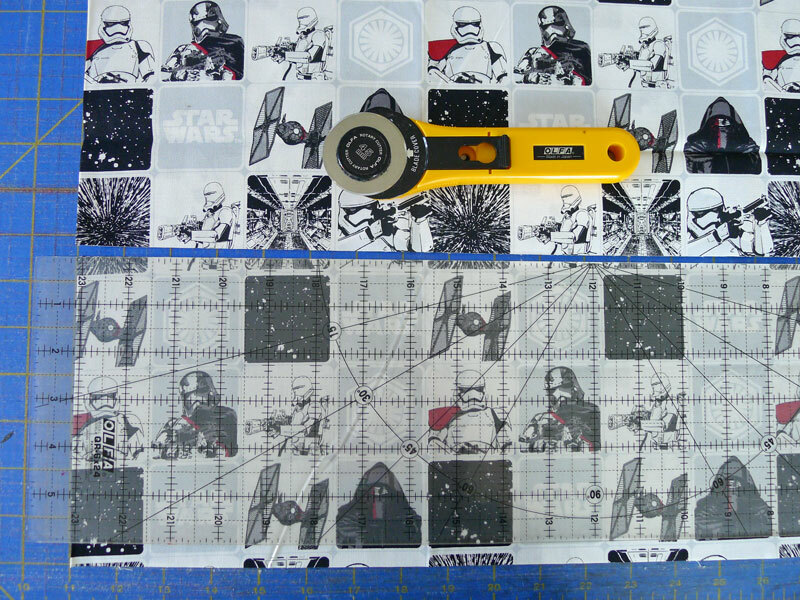 Choose some large scale and some medium and smaller scale prints for variety. 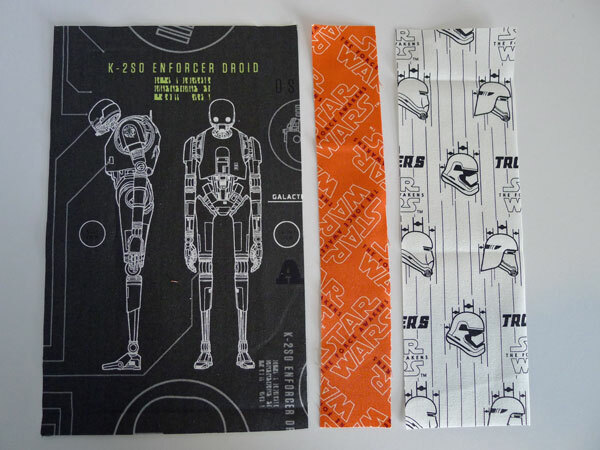 Licensed fabric (such as official Star Wars fabric) tends to be "busy". 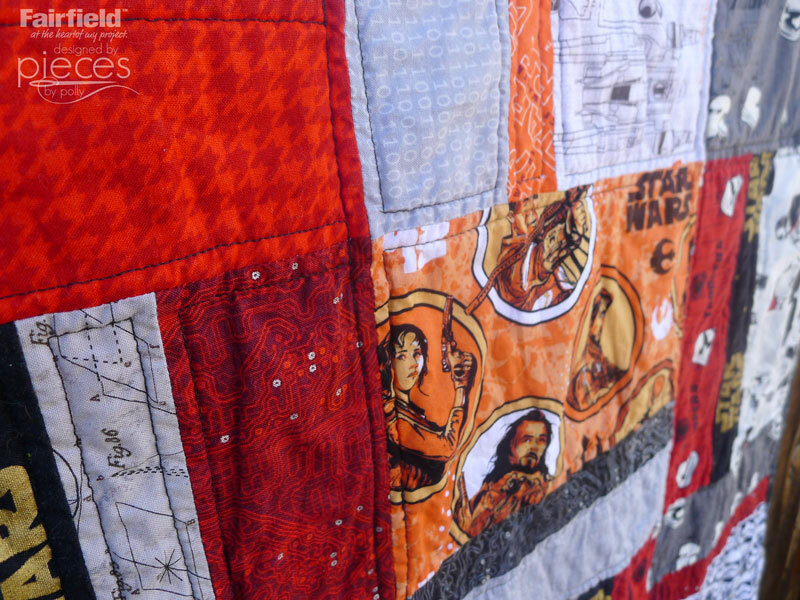 You may want to choose some solid or blender fabrics that are not licensed to help calm down the quilt. (For me that was the circuit fabrics, the grey 0/1 fabric, and the red houndstooth. Use some variety, but keep the colors coordinated. I chose red, orange, black, white, and grey. See the Video below for examples. 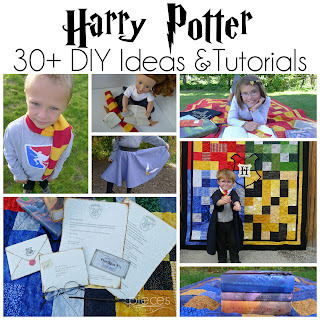 Start by Grouping your Fabrics into sets of 3. For the most part, I matched up one dark, one light, and one color into my sets. There are no hard and fast rules for this though. Mix and match to your hearts content until you're satisfied. 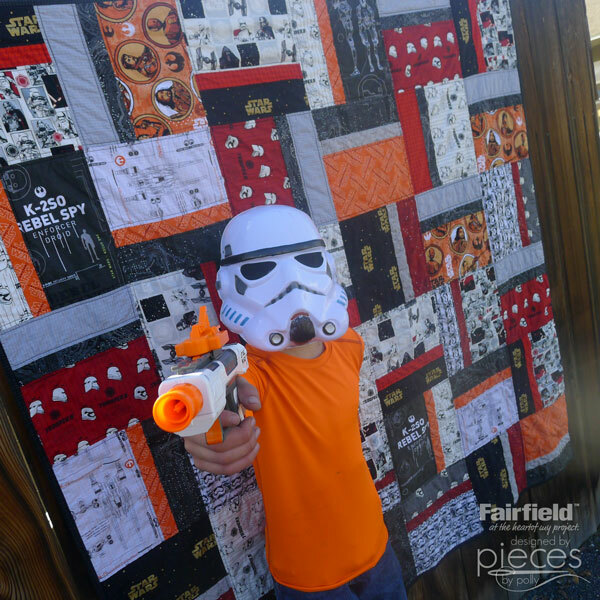 Once you've got your fabrics grouped, we're ready to start cutting out your quilt. 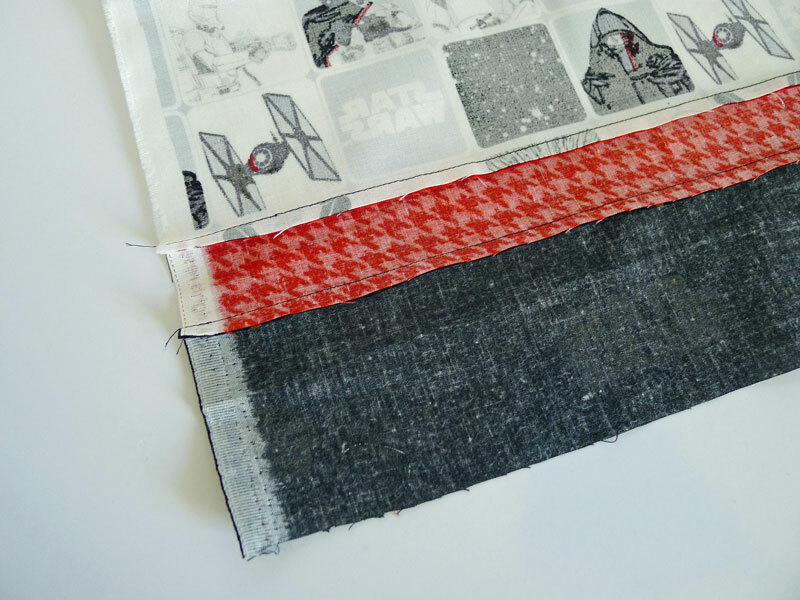 We're going to use "strip piecing" which means we're going to sew whole width of fabric strips together and then cut those into our blocks. 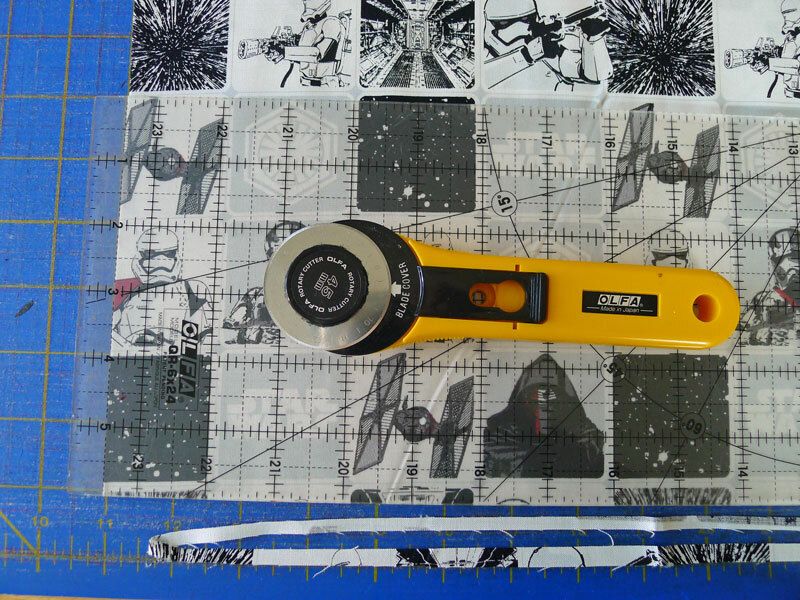 When I cut, I find it easiest to use the center seam to square my ruler. You'll want to start by trimming the end straight and square with the center fold. 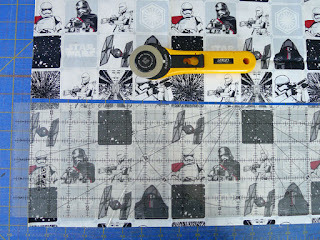 Each block will need one - 6 1/2" WOF strip, one 1 3/4" WOF strip for the middle, and one 3 1/4 inch strip. 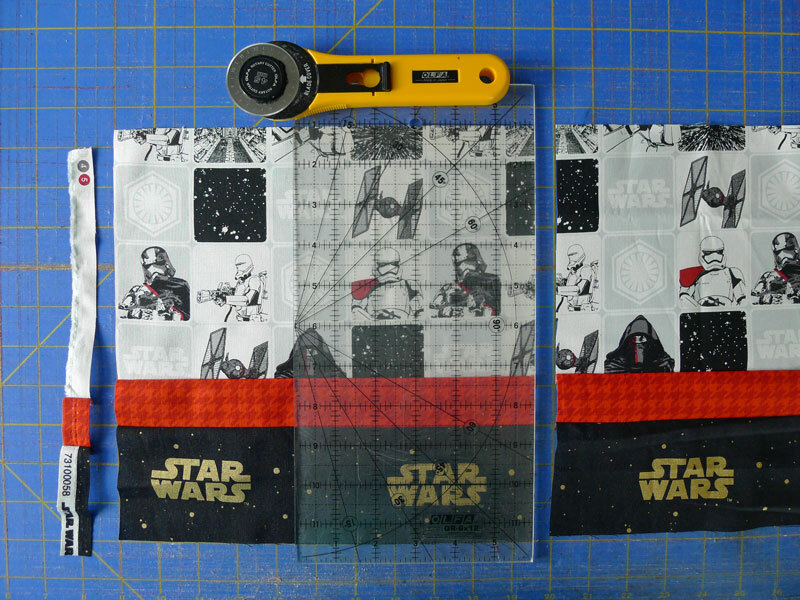 You may want to take some care cutting your strips to maximize the prints. For instance, I cut the black strips specially to get the whole Star Wars logo in the center. 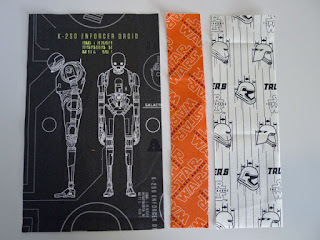 Stitch these together with 1/4 inch seam allowance and iron. You'll want to sew your strips so that sometimes the widest strip is on the top and sometimes it's on the bottom. 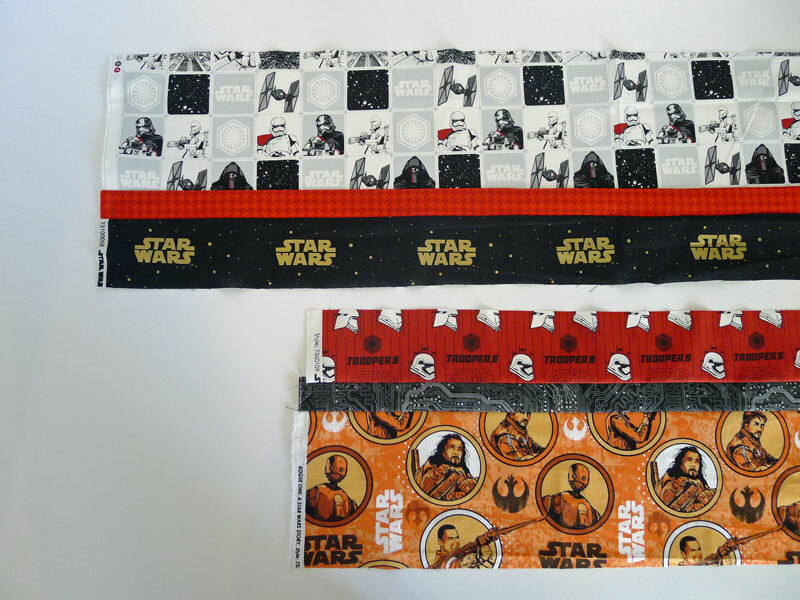 Repeat with additional fabric sets. Each set will yield 4 finished blocks. 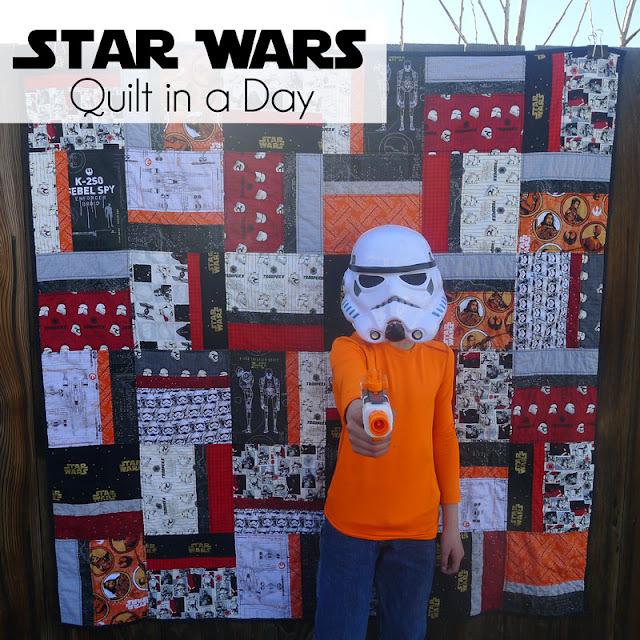 So you'll need 6 sets to make a 40"x 60" quilt or 9 sets to make a 60" x 60" quilt. 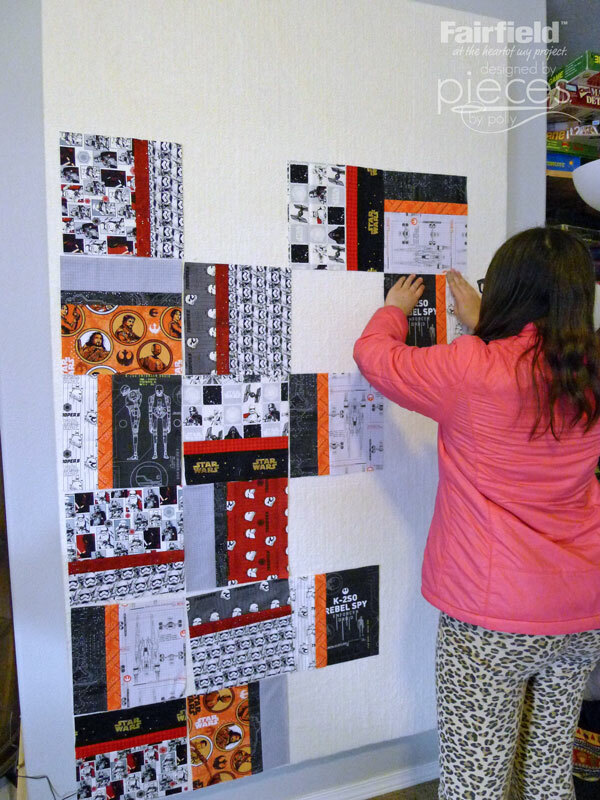 Once your strips are done, you can cut them into blocks. 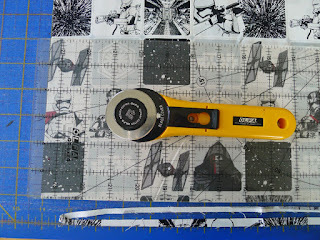 If you feel confident with your ruler and rotary cutter, you can line them up carefully and cut several strips at once into 10 1/2 inch blocks. If you have particularly large prints (taller than the 6" strip will allow), you may want to "fussy cut" some of your blocks. For those you'll need to cut the individual pieces out one at a time. I did this to show K-2SO to best advantage as well as some of the spacecraft. For each single block, you'll need 10 inch strips of one each 6 1/2 inches, 1 3/4" and 3 1/4. But ultimately settled for something a bit more random looking. You'll find that many of your prints will go sideways, but we tried not to have any of them upside down. My kids love to help with this. 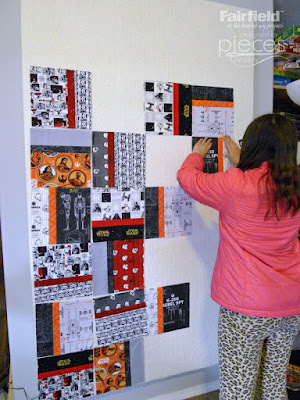 When satisfied with your design, sew your blocks together with a 1/4 inch seam allowance. 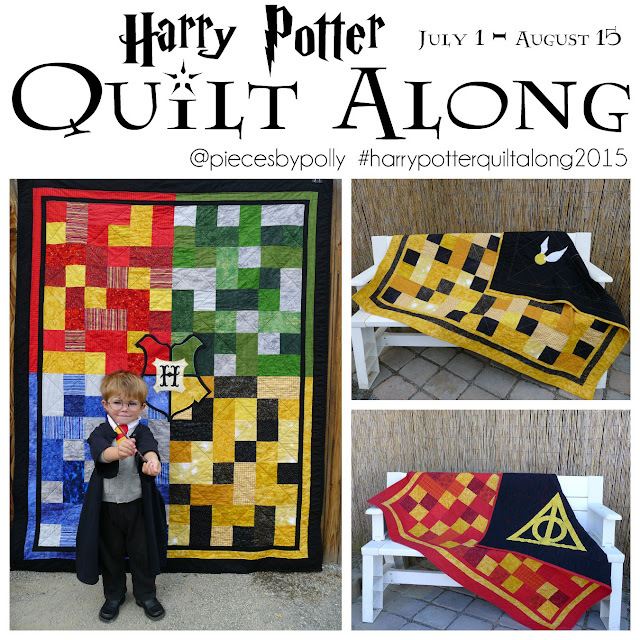 Baste and quilt according to your favorite method. I prefer to use basting spray and a double thick binding. 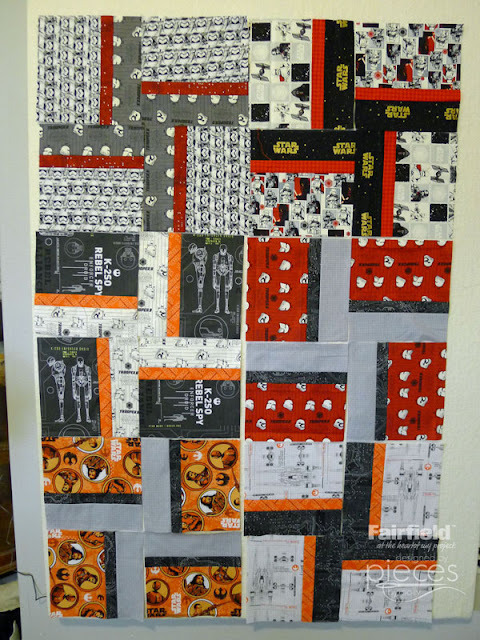 And I had so much fun making the blocks....I ended up making enough extra for a whole extra quilt. 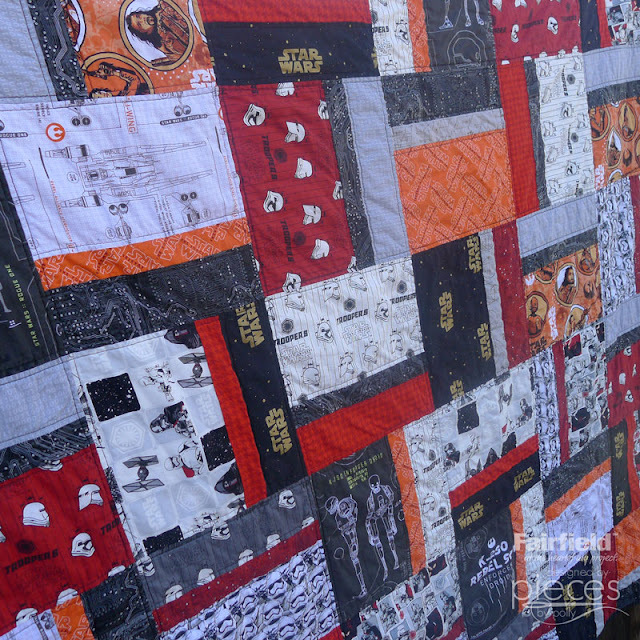 You can find that Star Wars Quilt for purchase in my Pieces by Polly Quilt Shop here. beautiful quilt. 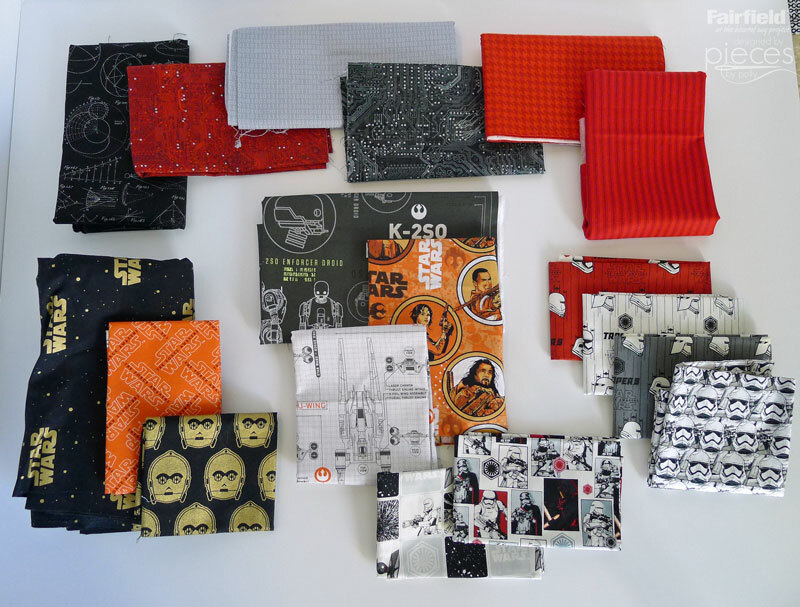 Where did you find all the awesome fabric. There are not a lot of fabric stores near me and the ones I do find (Joanne's) don't have great selections.